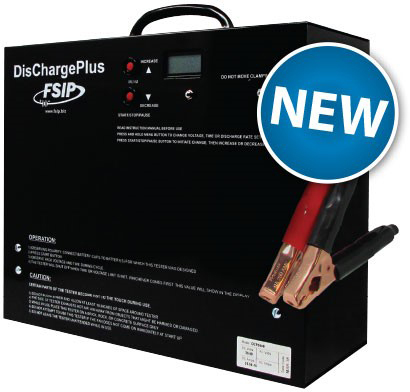 The DisChargePlus is a new battery discharger custom designed and available exclusively from Flight Systems Industrial Products (FSIP). The DisChargePlus is for use on 36 and 48 volt battery packs, to measure the time the batteries are able run on a single charge. As batteries age, capacity testing is imperative, and the DisChargePlus is an easy solution for accurate battery capacity measurement. The DisChargePlus features 3 programmable discharge rates or time & shut off voltage, as well as 8 foot connection cables with 200 amp clamps. The DisChargePlus has the capability to store the previous 14 discharge cycles and does not require AC power to operate. FSIP strives to expand their line of battery maintenance products with this new launch, helping their customers to expand their services and revenue streams. To shop all the products that FSIP offers, visit their new online store.